With six weeks to go in MLB's regular season, WTOP Digital Sports Editor Noah Frank checks in on where the races for the best pitcher and player in each league stand. WASHINGTON — It’s August, the pennant races are heating up, and it’s time to start debating who should win baseball’s biggest awards. Well, not debating, exactly. The aim here is to use a weighted model to try to predict how the voters will act when the time comes and predict who will win the Most Valuable Player and Cy Young awards in each league. We’ve done this in years past, but this year, we tweaked the model a bit to make it a little more dynamic and to normalize everything to a 100-point scale. This means the leader in each award category at any given moment will be given a score of 100, with everyone else’s raw scores put in relation to the leader. It makes things a little cleaner on the data entry end, and hopefully also for the reader. As always, the model is derived using a combination of statistics that voters value when assessing the field. The idea isn’t to tell you who should win, but rather who will win. With that, find the current standings in the gallery and read through the explanations below. Note: All stats have been updated through the games played Monday, Sept. 24. We’ll make updates periodically as the season continues. 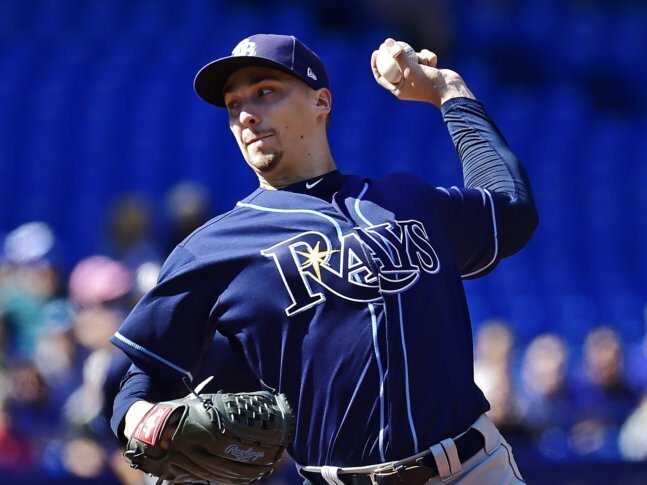 With Chris Sale’s injury and Blake Snell’s 20+ wins and sub-2.00 ERA, the Rays’ ace has slipped in front in what has become an incredibly tight, four-horse race. Sale has posted such dominant numbers that it was hard to see him losing this award just a few weeks ago, but with only 12.1 innings since Aug. 1, he’s come back to the field. Mookie Betts is definitely the favorite right now, but it’s hard to say just how close J.D. Martinez is to his teammate. Martinez suffers from serving primarily as Boston’s designated hitter (70 of his 114 games). Francisco Lindor and the injured Mike Trout aren’t too far behind, and there’s the possibility of some vote splitting between teammates, but Betts is on track to win both a batting title and lead the league in WAR, satisfying both the old and new school voting contingent. Jose Ramirez presents an interesting threat from a smaller market, though he could also suffer from a vote split with Lindor. Jacob deGrom’s brilliant year for the dreadful New York Mets will create the most interesting awards debate, as he may finish with half the win total of some of his peers. Max Scherzer’s been better in nearly every major statistical category, but deGrom’s sub-2.00 ERA trips one of the escalators in the model and currently has him out in front. It doesn’t hurt that both WAR models also currently prefer deGrom (looking specifically at pitching WAR), giving him a push for both new and old school voters. No race has changed as much in the last month as this one, and it is nowhere close to settled. There’s still a chance a pitcher could factor in, though there’s no mechanism in the model to account for that, so only position players are listed here. Christian Yelich’s second cycle of the season (and second against the Reds) has propped him into the lead for the first time, though Javy Baez is essentially in a statistical dead heat. The final few games of the season will decide this one, with as many as six position players (Nolan Arenado is just outside the top five) in the hunt, not to mention the possibility that either deGrom or Scherzer win it.